Soft and great quality. A perfect sized THROW - this isn't a twin sized blanket and it doesn't claim to be either. All these reviews stating it's too small aren't paying attention to the item details. I use them over my legs at night while watching tv and my doggies have a bunch to nuzzle in. GREAT BUY! I highly recommend them. Keep your family warm and be prepared for surprised guests with this TrailWorthy pack of fleece blankets. 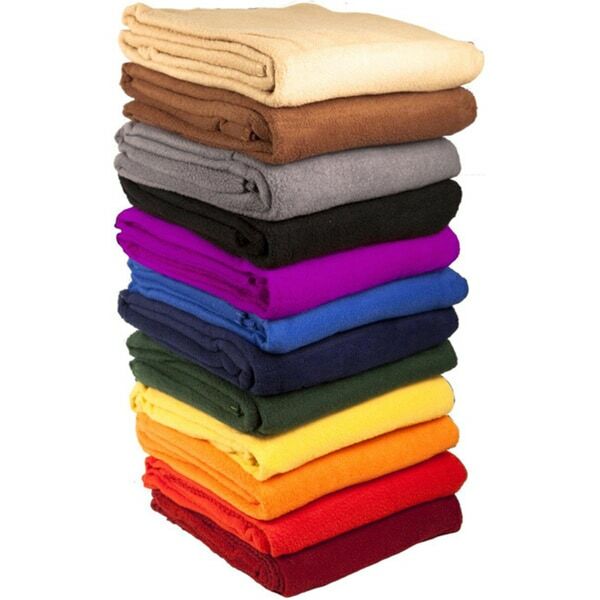 This set of 10 blankets includes a variety of colors, so each person can pick their favorite one. Alternatively, use the different colors to complete a new home redecoration project or cycle through the seasons. This set of blankets comes with a convenient reusable zipper bag for convenient storage in walk-in closets or other storage areas. The durable material is safe for use indoors or outdoors, making them ideal for families who travel often or enjoy camping out. These "blankets" we're not at all what I had hoped for. I will partly take responsibility for expecting a larger blanket than what the measurements read but, come on...you call something a blanket and you expect a blanket. This peice of fleece is not a blanket, it is a peice of fleece. And I suppose if I were going out into the great outdoors hiking it would be perfect to throw in my backpack...but I'm not, and it's not. So, buyer beware on this item! It's a peice of fleece! The blankets are nice, soft and good quality for the price. They shipped very quickly. I only wish I could have received one of each color (like a rainbow) instead of a single color. I purchased these to donate to the locate animal shelter and they were so nice the volunteers there all wanted to keep one however I told them they were not expensive and to order their own (which many of them did.) They are not large but soft and cozy, perfect for an family picnic, afternoon nap, or just to cuddle with during a movie. I ended up getting more to have on hand for my family. Love them! I bought these for an outdoor family reunion. I wish i could have had a mix of colors. These were in expensive: they're polyester &amp; made in china. You get what you pay for! To donate to the local dog rescue. "Do these Blankets say "FIRE RETARDANT" or something similar on the tags? Thank you." Hello packageplanet, no, they do not have a fire retardant or similar label on these blankets. Thank you for shopping with us.